Second Harvest’s Nutrition Program steps it up! The Passion for Produce program continues to grow thanks to the tireless efforts of Second Harvest’s nutrition team and its many volunteer Nutrition Ambassadors. The program offers over 300 peer-led classes per year on nutrition, meal preparation, menu planning, physical activity and social support to low-income individuals and families. 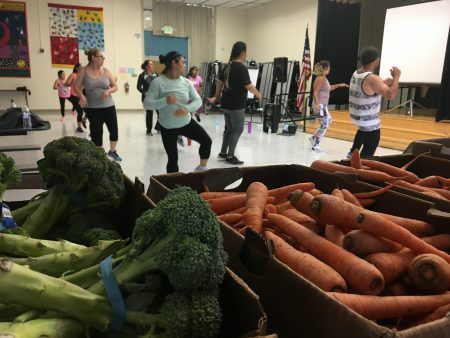 The newest offering at two of the program sites — in conjunction with the free nutrition classes and farmer’s market-style produce distributions — are free Zumba® exercise classes. Popular for its welcoming vibe and infectious music, Zumba fits naturally into the whole-person approach that guides Passion for Produce’s mission. For more information about our nutrition programs, visit this page.